The village of Biot is more than 2,500 years old, and retains much of its medieval charm in the 15th-century architecture and narrow, winding streets. 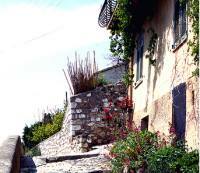 The town's old walls and gate can still be seen, as well as a number of other small, historic features strewn throughout the hilltop community. The town has been a hub for craftsmen for centuries, and is known for its pottery and blown glass, making it a popular shopping destination for tourists in the French Riviera. There are several glass-blowing factories that offer tours, allowing visitors to watch the age-old process in action. Biot is also the site of an ancient volcano, and geology buffs will enjoy hiking the scenic rock formations. There are several other pleasant walks through the surrounding hills and woods and the feel in the countryside is pastoral and peaceful, with plenty of shade and bubbling streams. Located less than three miles (4km) from the coast, Biot makes an excellent daytrip when visitors want a break from the pleasures of the beach. The village is busy year-round but gets particularly crowded during the summer (June to August); even so, it is slightly off the main tourist path and remains one of the less commercial villages.